Our Car Breakdown and Roadside Recovery Trends 2017 article is a follow up to our previous article, that you can have a read through here. Based on Auonational’s 2017 statistics report we have compiled more information about the current breakdown trends. We have found that majority of breakdowns are reported at the roadside, while the rest have been reported at home. So before you leave your home, why not spend a couple of minutes making sure that the most basic car vitals are in order. The graph above shows that home assist has a much higher repair rate than roadside assist, bear that in mind before you get on the road with any car faults that you are aware of. 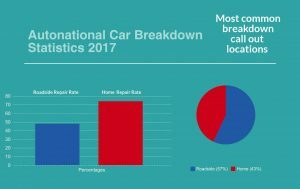 When it comes to breakdowns, there are more than plenty of reasons for those to happen, just as the Part 1 of our Autonational Car Breakdown Statistics 2017 article discuses. And as you can probably already guess, every breakdown reason will require a different solution and hence often cause a different outcome. The graph above shows those that are the most common, Whatever the outcome, your breakdown service provider will always do their best to repair your vehicle on the spot, unfortunately, as the graph suggests, this is not always possible. Based on our annual report statistics, it would seem that Monday has been the most common day for breakdowns to be reported, while Sunday proved to be the least common. This is most likely occurring due to what activities people tend to carry out on different days of the week. Monday tends to see the busiest time for breakdown call outs, arguably due to it being the most common first work day of the week. If the owner does not use the car during the weekend, it is likely that something might have been left running and draining the battery leading to non start. Perhaps a deflation of tyres wasn’t spotted early and stopped, leading to complete deflation and need for emergency assistance. 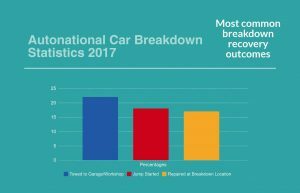 Many factors can be taken into consideration when pin pointing as to why breakdown call outs happen, just as our Car Breakdown Statistics 2017 suggest. But one thing is for sure, it is extremely important to have the best cover possible in case you do breakdown, at home or on the road. So why not get a cover with Autonational today? Check out our cover selection here.